The late Gerry Anderson's THUNDERBIRDS is finally returning to TV next year in a new series which - predictably - its creator wasn't asked to contribute to before his death. With luck, it will be better received (and perform better) than the big-screen incarnation (which - for me - wasn't great but wasn't the unmitigated disaster - if taken on its own terms - that the rest of the world would have you believe. The Jonathan Frakes commentary track on the DVD is refreshingly honest about reshoots and product placement too) of a few years back. TV does, however, have a track record for screwing-up the franchise. ITC themselves, in a mis-guided attempt to get the original show back on American TV, concocted something called TURBO-CHARGED THUNDERBIRDS (shades of Power Rangers) which excessively buggered about with the original footage in an attempt to make it more 'relevant' to today's kids. Lets hope that ITV, now (appropriately) owners of the ITC back catalogue, do a better job. That's a long-winded way of introducing this first issue of the 1991-launched THUNDERBIRDS comic, a runaway hit for Fleetway at the time. The early nineties boom in the Anderson back catalogue, courtesy of the BBC, is now the stuff of legend but conclusively proved that the best of the Anderson shows were generation-proof. 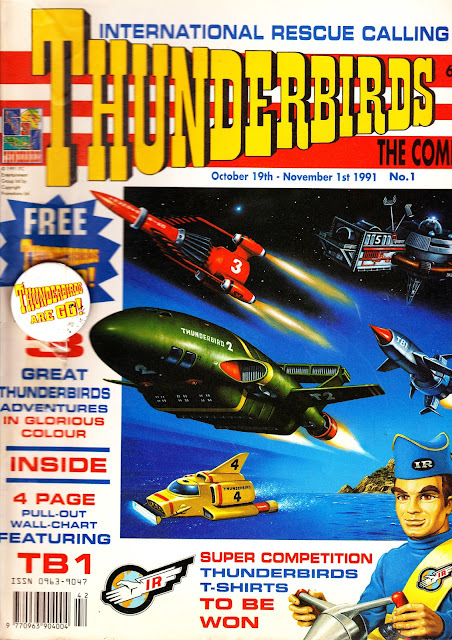 The comic - which must have been seen as something of a risk despite being part of a massive merchandising push - was a runaway hit and spawned several (albeit less successful) companions (CAPTAIN SCARLET, STINGRAY and even JOE 90) and spin-offs which all plundered Anderson comics of previous decades for material. FANDERSON, The official Gerry Anderson Fan Club, have recently run a multi-part article on the history of these Fleetway titles in the pages of their club magazine. It's only available to members (along with a host of classy exclusive merchandise) but, once you sign-up, back issues are available. Go on... indulge.